A man accused of starving and murdering his stepson said he only noticed the boy was "extremely thin" when he saw him in a mortuary, a court has heard. Mariusz Krezolek, 34, denied four-year-old Daniel Pelka was "disappearing inside his clothes". He and Daniel's mother, Magdelena Luczak, both deny murder and causing or allowing the death of a child but have admitted a charge of cruelty. He claims Daniel died in March 2012 after falling in their Coventry home. Under cross-examination at Birmingham Crown Court, Krezolek, who is accused of starving Daniel over several months, said he could not remember when he last read him a bed-time story or cuddled him. Prosecutor Jonas Hankin QC said: "This is a little boy who had been in your life for two years and you can't remember when you last tucked him in, read him a story or bathed him, or even played with him. "You didn't have his best interests at heart did you?" Mr Krezolek responded: "I think you're right. Not because I didn't want to but because my head was occupied with something else." Between September 2011 and Daniel's death from a head injury the following March, staff at his school had likened him to a little boy with leukaemia, Mr Hankin said. "He was disappearing inside his clothes wasn't he?" he asked. When asked if he was concerned about the boy's weight loss during that time, Mr Krezolek said: "To be honest I saw he was thin but not that he was extremely thin. "Everything became apparent only in the morgue." Stephen Linehan QC, representing Daniel's mother said to Mr Krezolek that "both of you had been responsible for the mistreatment of that boy" and one of them had killed him. 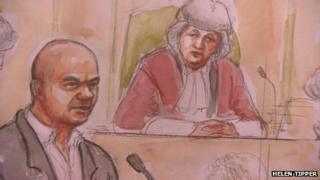 Mr Krezolek replied: "I did not see Magda do anything to him and I did not do it either. I have told you everything I saw in the house." But Mr Linehan maintained it was him that hit had Daniel. "I did not hit Daniel. I had never hit Daniel on his head," Mr Krezolek said.